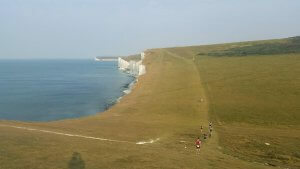 During the August Bank Holiday weekend our good friend Ben Green and two teaching colleagues decided to take on the challenge of running the South Coast Challenge, a 100km off road race from Eastbourne to Arundel. Ben and one colleague, Chris Cox, took part to raise funds for Thinking of Oscar and their other colleague, David Saker, was running to raise money for The Alzheimer’s Society. 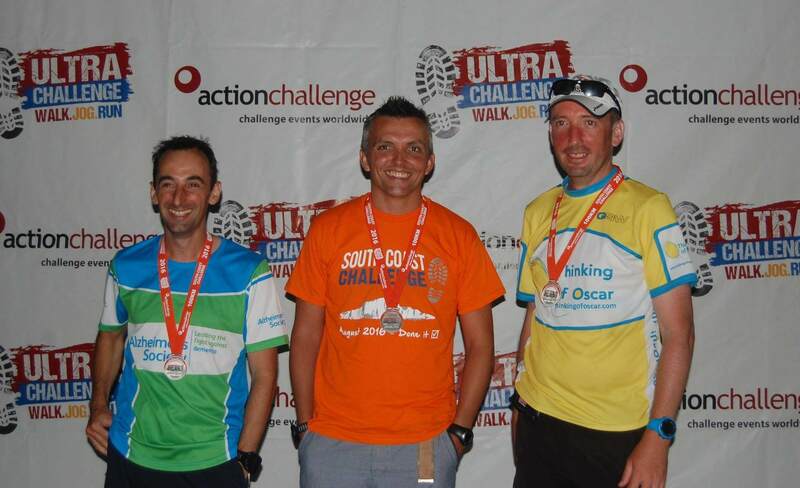 Between the 3 of them they raised in excess of £2700 and miraculously all finished the race. There were 860 starters and just 217 finishers. Their accomplishment has also been chronicled in their local newspaper the Eastern Daily Press. You can read the article here. Our families mirrors David and Hannah’s. Our daughters were best buddies until the age of two. David and I were captain and vice captain of a brilliant cricket team. Hannah and Hannah (they have the same middle name too!) were just four weeks apart through their second pregnancies. When we moved to Swaziland we were sorry not to meet Oscar who was born 2 weeks after we left. We never dreamed we would be flying home for his memorial service. Nobody deserves to go through what they have been through and though we felt their loss terribly we know it is merely a tiny fraction of their reality. Recently when Ted was in hospital we know that we were lucky, but it was nonetheless quite harrowing for a short time. David and Hannah’s desire to improve the lives of children in hospital is one I completely agree with and hope that by fundraising for Thinking of Oscar I can help this to spread. So I survived just. It was hotter, more humid, hillier and way harder than I imagined. The word challenge in the race title should have been a clue in hindsight, anyway I had a fantastic day (and a good chunk of night) with a really brilliant field of runners around me and thank you to all those who have supported Thinking of Oscar as a result. Coming up with the idea of taking on a challenge for TOO was easy but the inspiration to finish when it got almost too tough came from Oscar and his family. Thank you so much and well done to Ben and Chris and everyone who supported them. Well done also to David Saker who raised over £1,200 for The Alzheimer’s Society.